Stat of the week: Only 26%. That’s the percentage of touches registered by female players across the 18 taped Nationals mixed games from 2014-2017. Along with a slew of other measurements collected by Kathy Frantz, this shows a skew towards male involvement in the highest level of the mixed game. You can read the entire report here. 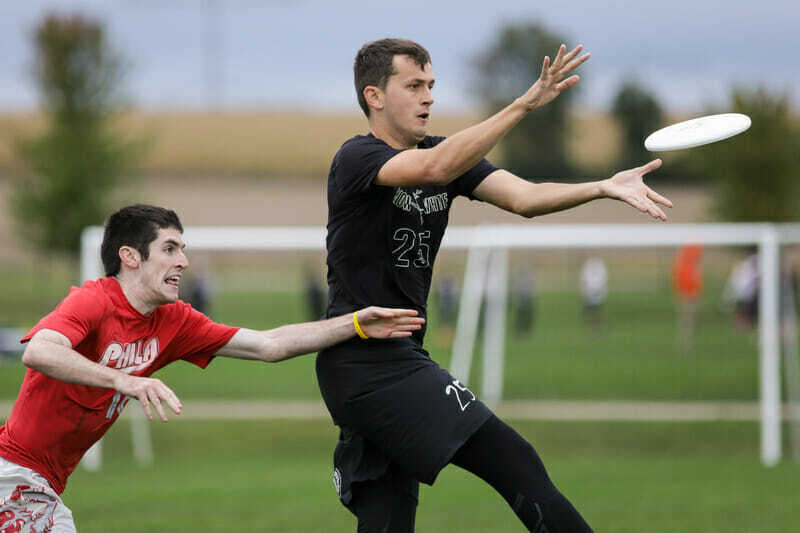 Catch of the week: You can see Boston Slow White‘s Todd Herman with the monster sky against Boston Wild Card in their pre-Worlds showcase game here. Stars on the move: This past week it was announced that longtime Seattle Riot star Sarah “Surge” Griffith would be competing in the Club Series with San Francisco Fury, helping Fury reload for another title run. Also, announced was New York PoNY landing Denver star Jimmy Mickle after WUCC; the addition of Mickle along with swirling rumors that Beau Kittredge could eventually follow suit adds intrigue to the Northeast men’s scene amidst Boston’s realignment and the return of several stars to Toronto GOAT. Although Seattle Riot emerged the champions of Eugene Summer Solstice with a 15-10 win over San Francisco Fury, both teams were able to notch significant wins over one another. Fury took their Saturday pool play matchup 13-7. It’s hard to know what the takeaway should be from the weekend, presumably with neither team showing the other all they had ahead of a potential WUCC meeting; both teams prioritized developing their roster and preparing for Worlds over winning. San Francisco Nightlock, Portland Schwa, and Seattle Underground all looked similarly matched, finishing 3rd, 4th, and 5th respectively, but could not crack the top tier with four not very close losses to Fury and Riot between them. Boston Siege went 7-0 with wins over New York BENT, Quebec Iris, and Montreal Vintage at the Boston Invite. BENT and Iris had an incredible semifinal matchup that went down to the wire as BENT won on double game point to advance to the final. Portland Rhino Slam took down Vancouver Furious George in the final of Eugene Summer Solstice in a matchup of the two top seeds in the tournament. Rhino Slam marched through Oregon’s other top teams in the quarterfinals and semifinals, Portland Rip City Ultimate and Eugene Dark Star. Back on the East Coast, Boston DiG went mostly unchallenged through the Boston Invite taking down Boston Big Wrench in the final with a 15-5 win. The true winners of the tournament may have been the semifinalists Montreal NSOM and Albany All Bashed Out, two masters teams who performed strongly leading up to masters worlds. NSOM took the 3rd place game with a thrilling 17-16 universe point win. Lexington Black Lung and Dayton Enigma both went 5-1 in the two-day round-robin SCINNY. The two biggest takeaways from the mixed division at the Boston Invite this past weekend were Philadelphia AMP‘s consistency and poise and just how crowded the Northeast mixed division is going to be this year. Untested in pool play, AMP had two much closer games in the semifinals and final against Boston Slow White and newly formed Boston Snake Country; Slow White and AMP may have another chance to see one another at WUCC in a few weeks. As for the rest of the Northeast mixed teams, they will continue to prepare for Regionals which, while always competitive, could be downright apocalyptic as Slow White, Wild Card, and Boston League of Shadows rock, paper, scissored themselves into a three-way tie at the top of Pool B . The craziness continued with fellow Northeast rivals New York XIST notching a win over Wild Card but losing to Toronto UNION. This tournament will be a mess we’ll let the ranking algorithm sort out but previews an exciting year, especially if the region gets three or fewer bids. All of this madness unfolded without Pro Flight Connecticut Metro North in the fold. West Chester LOCO tore through the competition at the 24-team Summer Glazed Daze in Winston-Salem, NC, including an upset of number one seed Durham Toro. Spirit of the Plains and Texas Two Finger are the only sanctioned tournaments on the books for this upcoming weekend and will feature competition in all three divisions for Midwest and South Central teams, respectively. Comments on "Club Update: Top Womens and Mixed Teams Prepare for WUCC at Boston Invite and Eugene Summer Solstice"